Looking through my older pictures I found this favourite. I thought I would give it a post now. This was made for a colleague’s birthday. 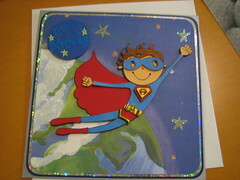 The superhero character was actually on shop bought card. 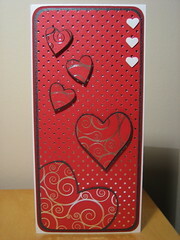 I traced the image and created a decoupage from coloured card stocks. At the time of making the decoupage piece I had no idea how to complete the card until one of the ladies at a craft group I go to pulled out the fab backing sheet with the globe on it. It’s one of my favourite cards I think. Visiting friends for lunch? What do I take? 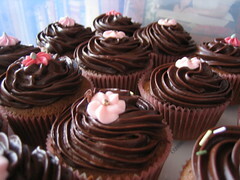 Whipped up these yummy confections in no time at all. Look fantastic and very little artistic skill required. Drool over them while you can. Five minutes in a room with 5 hungry kids and they will be gone. I love these papers from Craftworkcards in all their colourways and these from the Romance range are no exception. A simple idea. The larger hearts are cut by hand and the smaller two sizes with a shape punch. This was made to order so I hope the recipient likes it.